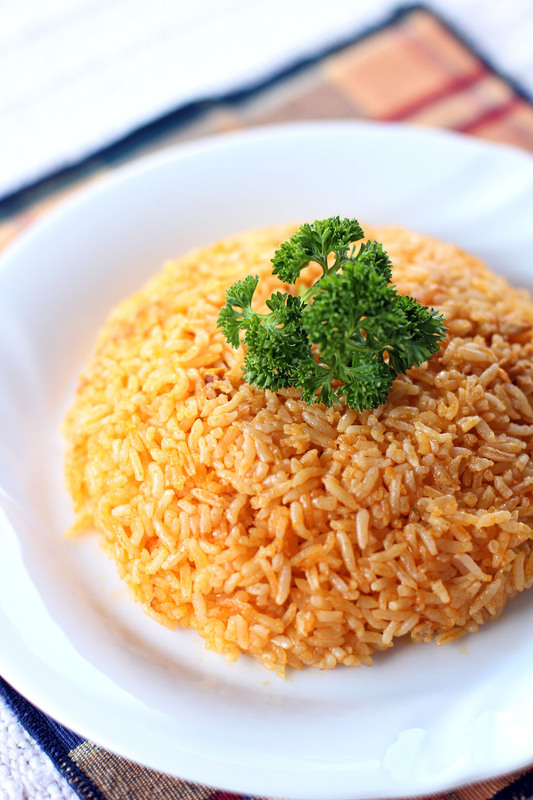 I never had seen rice prepared in a similar way with other cuisines so where did this dis originated? Is it Spanish in origin or Indonesian as the name hints, well I am not really sure. So people claim it came from Indonesia just look at this Yahoo Answer but I guess they don’t know what they are referring to as this one in my opinion is distinctly Filipino and it does not use turmeric, we use annatto seed to make it reddish orange in colour. One thing I know though is that the first time I tried it was in my primary school cafeteria, it’s a popular lunch dish paired with Filipino style barbecue. It is also popularized by Aristocrat restaurant I am not sure if they still exist but they make the best chicken barbecue ever again paired with this rice and some pickled raw papaya (atchara) on the side. So for today we will be making one, just take note this rice goes really well with anything barbecued. Heat oil in a wok then add the annatto seeds, stir fry in medium heat until oil turns reddish orange in colour, roughly around 1 minute in medium heat. Remove and discard the annatto seeds leaving the oil on the wok. Add garlic and stir fry until lightly browned. Add the shallots and sauté until soft. Add rice then stir well, evenly distribute the oil while stir frying. Turn heat to high then cook for 5-7 minutes while occasionally stirring. This sounds damn tasty with all that delicious garlic. One question though, I have annatto powder but not the seeds. How can I make this recipe with the powder please? You can replace it with 2 tsp of annato powder, saute it but in low temperature oil. Thanks, looking forward to this very soon. I’m intrigued by anatto seeds. How does it tastes? Sweet, nutty and peppery but not that strong. This is like the Masala Rice we make in India! The annatto seeds sound different in the rice. Great idea! 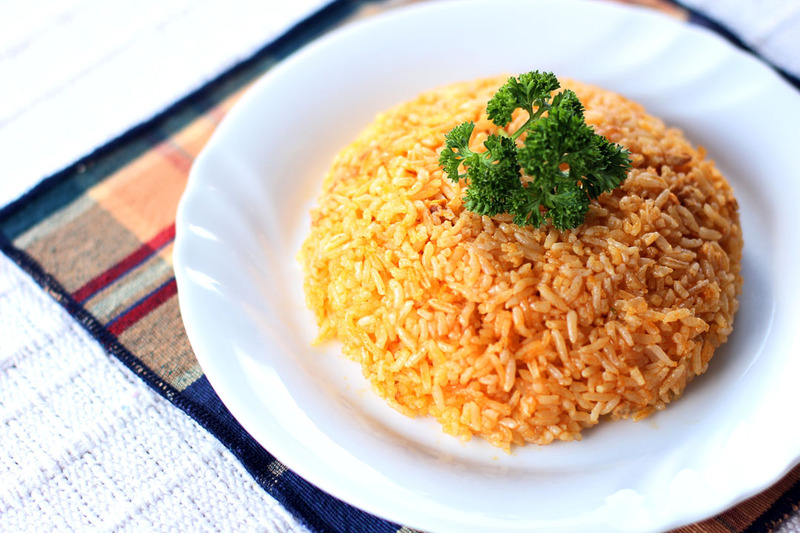 This is the first I’ve read or heard of this rice and also, annatto. Is there any other ingredient that can replace annatto? I’m in London and am not sure where I can get annatto. I am afraid the only replacement is annato powder, you can buy them in Asian shops. I’ve never tasted annatto seeds but you’re right – they do impart a beautiful color. This rice looks delicious! Thx to you i’m on search for annato seed now Ray…. This recipe is great! For so many years I only found it now! Great! It was delicious! Thank you! I used to think the only way I get this is if I go to Toppings 2. I’m glad I can make it at home! Me too, Sheilla! Lol! I’m trying this for a bbq potluck at work. When should I add the salt? Ooops sorry I forgot to add that but it should be on step 4.